The speed of your website is critical in determining how many people will stay on your site. For example, KissMetrics has determined that for every second that your website takes to load, you lose a certain number of users. 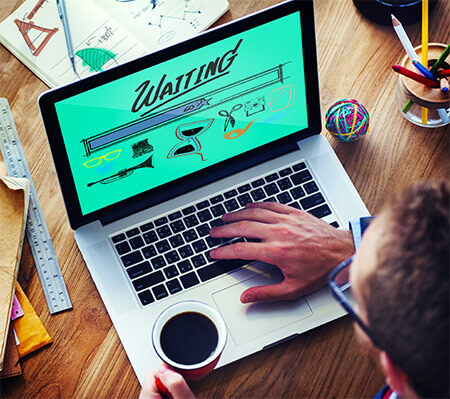 If your site only takes two seconds to load, your abandonment rate will be low, somewhere around five percent. However, by the time you reach ten seconds, the abandonment rate is much higher, more than thirty percent. That’s a huge hit to your bottom line, especially if you’re using paid advertising to generate these leads. To combat this, and make your website run as quickly as possible, here are five easy tips to follow. If you’re using WordPress to power your company’s website, it can be tempting to install all sorts of different plugins. There are so many available, lots of them are free, and they all seem to offer some sort of interesting benefit. The problem is that the loading of plugins can dramatically slow down your website’s load times. Not only that, but certain plugins are incompatible on smartphones, which can make your responsive layout look unprofessional. To combat this, consider getting rid of all unnecessary plugins. There’s no perfect number to have, but it should be as few as possible. Content Delivery Networks (CDNs) are a series of servers that are located around the world. The benefit of paying for them is that they allow you to store your images at servers in different countries, which will improve the load time of your website to visitors in these countries. If a person is browsing in Germany, instead of having to load an image all the way from Florida, they can load it right from a server in Berlin. Thus CDNs can do a lot to boost the speed of your website, especially if you have a lot of images that need to be loaded. It may be tempting to upload a large image, something like 4000px by 5000px, and let WordPress or your website platform take care of the rest. Unfortunately while convenient, this can slow down your load times. Your website has to run a script to resize the image, while the page is loading, which can cause it to load slower. It’s better to resize your images on your computer, then upload them to your website. Doing so may take more time upfront, but it will be worth it in the long run. While browser caching won’t affect the load speeds of first time visitors, it can dramatically improve speeds for people coming back to your website for the second, third, or fourth time. Browser caching allows a user’s web browser to download images and other pieces of information to their computer. That way when they return to the website they won’t have to load that data again, it’s already stored on their computer. If you use WordPress, the W3 Total Cache tool makes it easy to enable browser caching. Peter Drucker, one of the fathers of modern management, is well known for saying “What gets measured gets managed.” In this case, by measuring your website’s load times you can manage them, and get your website running as quickly as possible. Pingdom offers a great free tool which will not only tell you how fast your website is, but also how it compares to other websites on the internet. By checking your load times often you’ll be able to notice any irregularities and stay on top of everything. Not to be underestimated, the load times of your website are an important factor in reaching your website’s goals. If you’d like help with implementing any of the above steps, or want to look for other ways to improve your website, contact Superiocity. With years of web design experience, we can boost the performance of your site. Check out our website to learn more.